John Soh Chee Wen, the alleged mastermind behind the 2013 penny stock market-rigging, inflated the trading volume, liquidity and prices of three stocks so the shares could be used as collateral for financing, which would in turn be used to perpetuate the illusion of a bull run, the prosecution charged in its opening address on Monday. When the prices of the penny stocks at the heart of the conspiracy - Blumont Group, Asiasons Capital (now Attilan Group) and LionGold Corp or collectively known as BAL - reached a desired level, the shares would also be used to finance corporate deals. After corporate announcements were made, the share prices would be driven up further, to make it appear that the announcement had a positive impact on the market, added Deputy Chief Prosecutor (DCP) Peter Koy, who is leading a seven-strong prosecution team. Soh, 59, and alleged co-conspirator and former Ipco International chief executive Quah Su-Ling, 54, denied being behind the scheme and pleaded not guilty before Justice Hoo Sheau Peng on the first day of their joint trial in the High Court where they face 189 and 178 charges respectively. Included in the charges were three that accused Soh of fronting discussions with counterparties and bankers in respect of the BAL corporate deals - despite his bankrupt status which bars him from involvement in the management of companies. Soh also faces charges of witness tampering by interfering with no fewer than four witnesses in a bid to cover their tracks, DCP Koy said. Quah and Soh, who are said to have been acquainted since 2002 and in an intimate relationship at the time of the alleged offences, are accused of carrying out - from Aug 2012 and Oct 3, 2013 - "wash trading", or trading between themselves through a secret web of 189 accounts in the names of 60 individuals including Soh's sons and relatives and Quah's family. Soh also controlled trading accounts belonging to a "romantic partner", Ms Adeline Cheng Jo-Ee, as well as two companies owned by her and her father. DCP Koy said: "The appearance as to the market and price for BAL shares that was created by the accused persons was so utterly false that when the music eventually stopped and the bubble burst on Oct 4, 2013, the share prices of all three companies collapsed, each falling spectacularly by between 82 per cent and 94 per cent in just two days." In that short period, S$8 billion was wiped out from the market value of the BAL counters. 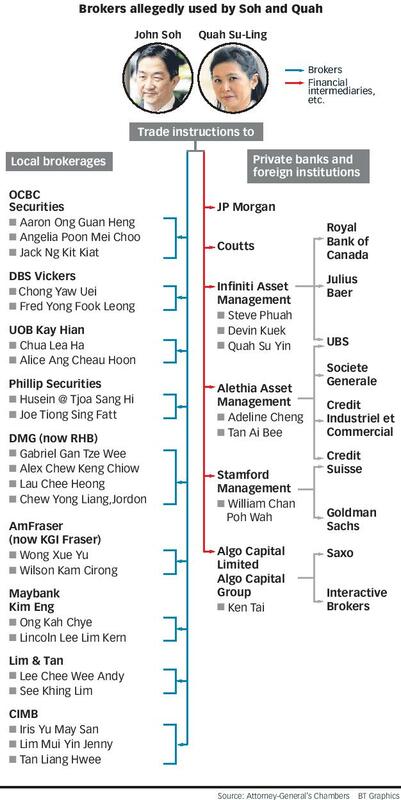 Quah and Soh are accused of funding their market cornering via cash accounts and margin accounts backed by BAL shares they pledged as collateral to get financing. The financing allowed them to engage in more wash trades and "feeding the false appearance as to market and price of the three stocks", the court heard. DCP Koy said the BAL-backed collateral grew more attractive as the scheme went on, and allowed the duo to obtain more and more financing. "In effect, this was a vicious cycle of deception, cheating, and market manipulation." Among the financial institutions that got burnt by the BAL collapse were Goldman Sachs International and Interactive Brokers, which were said to have been deceived into extending margin financing and delivering payment of over S$232 million. As for the cash accounts, trades were executed on contra, that is, trades are reversed - and profits and losses realised - before they have to be settled. Quah and Soh were said to have been aided by their 59-year-old co-accused Goh Hin Calm, who last week pleaded guilty and was sentenced to three years' jail for allowing accounts to be used by the pair, and helping them to keep tabs of their shareholding in the three stocks and handling payments for the trades. Before the defence started to cross-examine witnesses on Monday, defence lawyers and the prosecution crossed swords over the late service of witnesses' statements and changes in the telecommunications data crunched by a Government Technology Agency analyst. The dates in the earlier set of data were found to be erroneous due to a "technical refresh" in the computer. The prosecution said the data showed repeated communications between the accused persons and trading representatives operating the controlled accounts - over 40,000 times - suggested that those communications were not "coincidence or mere casual conversation", but were instructions from the duo to execute the manipulative trades. Soh's lawyer N Sreenivasan, assisted by S Balamurugan and Jason Lim, raised objections to the revised data: I won't say shifting of goalposts, (but) change of stadium... No point saying I'm at fault, it cuts no ice with my client in the dock." The Senior Counsel disclosed that the defence would need to spend an additional US$25,000 to have the revised data analysed. Quah's counsel Philip Fong asked the Judge to exercise discretion and not to admit the evidence that is "procedurally unfair" and "prejudicial" to the defence. DCP Koy explained the circumstances for the matters complained as well as provided a comparison table that showed the differences between the two sets of GovTech data. The much-awaited trial, which is scheduled to run till November, continues on Wednesday, with the prosecution having lined up 26 witnesses for the hearing up to May.